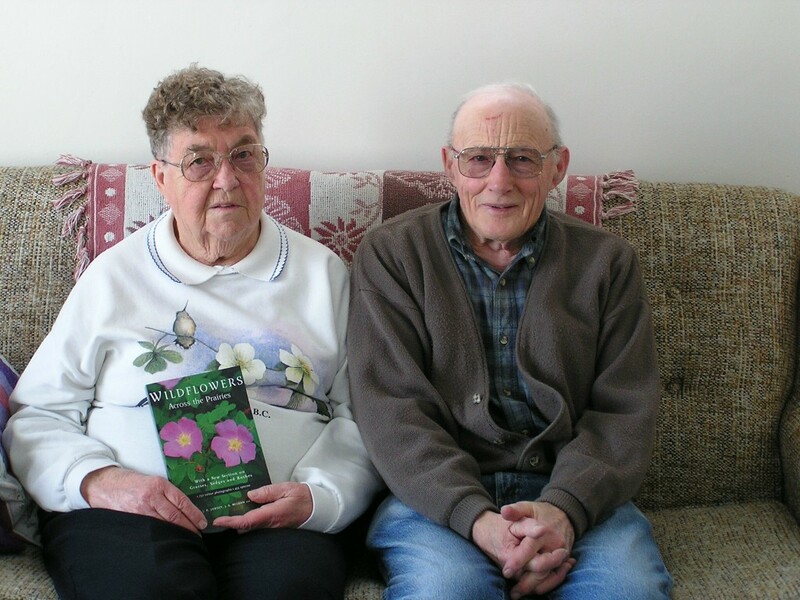 More than thirty years ago Jim and Shirley Jowsey of Saltcoats began the work that would lead to the publication of Wildflowers Across the Prairies. The book is co-authored by F. R. Vance, J. R. Jowsey and J. S. McLean. The volume, considered the authoritative field guide to prairie flora, contains beautiful photographs, clear line drawings and a reader friendly text. More than 100,000 copies have been published since 1977. The book is still available at local book stores. The project received funding – not total funding, but enough to get started on the field work. Jim called on Fenton Vance, a photographer who would contribute many of his images of wild plants and flowers to the publication. Through the newsletter of the Saskatchewan Natural History Society, Jim and Shirley came into contact with other photographers who contributed photos to the project. Jim took two months off work to collect further photographic material, specimens for sketches and plants for a reference herbarium. Shirley was his able assistant hunting down and identifying plants. In all, there are 320 photographs in the book. J. S. McLean completed the sketches. Jim Jowsey wrote the description of the plants including their common and botanical names. Frank Switzer completed a section on grasses for later editions of the book. The book went to the publishers, Western Producer Prairie Books, in 1977. The company, mindful that it needed to publish and sell 10,000 copies to make a profit, worried about storage space. The worry proved unnecessary – the first printing was sold out within the space of a year. The book is now into its third edition and its eleventh printing. In the United States, the book is printed by the University of Minnesota Press. The guide is for everyone from a child in school to a university student, to a farmer interested in the plants of the area to a visitor wishing to know a little more about his tourist destination. It has been seen in the cottage at the lake, the back seat of the car and the backpack of the hiker along the nature trail. It is even a prescribed book in the study of landscape architecture at the University of Manitoba. The Jowseys extend their interest in the natural world beyond the realm of plants to birds and animals as well. Every year they participate in the Saltcoats Christmas Bird Count. The Count, now done in more than 1800 localities in Canada, the United States and Latin America, advances the understanding of birds and their habitats and builds the skill, enthusiasm and support of the birding community. In 2005, there were 98 bird counts in Saskatchewan involving 802 observers. More than 133,000 birds of 99 species were recorded. 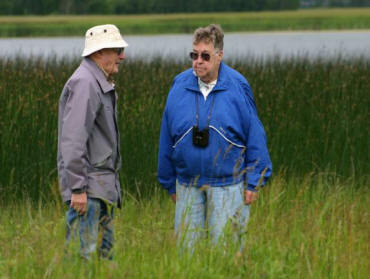 Over the years, Jim and Shirley Jowsey have participated in many a bird count in various locations in the province. marshes looking for birds or identifying wild flowers. The Jowseys are environmentalists of the highest order. They have placed a permanent caveat on that portion of their quarter section of land that has never been broken. The caveat held by the Nature Conservancy of Canada means that the land cannot be cultivated – ever. Six or seven years ago, Jim and Shirley Jowsey decided to bequeath the remaining cultivated portion of their land to the Genesis Land Conservatory, a land trust of Earthcare Connection. The land will remain in their care until their deaths and then pass to the management of the Conservancy. Earthcare Connection is a program funded by the Roman Catholic Church, the Ukrainian Catholic Church, the Anglican and United Churches and the Evangelical Lutheran Church. The Trust encourages new families to take up farming using sustainable farming practices.